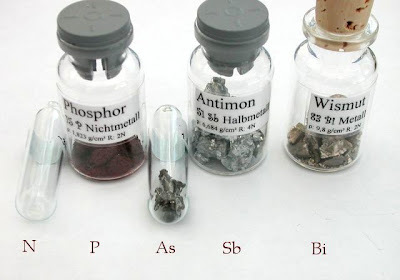 The nitrogen group is a periodic table group consisting of nitrogen (N), phosphorus (P), arsenic (As), antimony (Sb), bismuth (Bi) and ununpentium (Uup) (unconfirmed). This group has the defining characteristic that all the component elements have 5 electrons in their outermost shell, that is 2 electrons in the s subshell and 3 unpaired electrons in the p subshell. They are therefore 3 electrons short of filling their outermost electron shell in their non-ionized state. The most important element of this group is nitrogen (chemical symbol N), which in its diatomic form is the principal component of air. Binary compounds of the group can be referred to collectively as pnictides. The spelling derives from the Greek πνίγειν (pnigein), to choke or stifle, which is a property of nitrogen; they are also mnemonic for the two most common members, P and N. The name pentels (from the Latin penta, five) was also used for this group at one time, stemming from the earlier group naming convention (Group VB). These elements are also noted for their stability in compounds due to their tendency for forming double and triple covalent bonds. This is the property of these elements which leads to their potential toxicity, most evident in phosphorus, arsenic and antimony. When these substances react with various chemicals of the body, they create strong free radicals not easily processed by the liver, where they accumulate. Paradoxically it is this strong bonding which causes nitrogen and bismuth's reduced toxicity (when in molecules), as these form strong bonds with other atoms which are difficult to split, creating very unreactive molecules. For example N2, the diatomic form of nitrogen, is used for inert atmosphere in situations where argon or another noble gas would be prohibitively expensive. The nitrogen group consists of two non-metals, two metalloids, one metal, and one synthetic (presumably metallic) element. All the elements in the group are a solid at room temperature except for nitrogen which is a gas at room temperature. Nitrogen and bismuth, despite both being part of the nitrogen group, are very different in their physical properties. For example, at STP nitrogen is a transparent nonmetallic gas, while bismuth is a brittle pinkish metallic solid.